While perusing the American news media yesterday, I came upon an interesting exchange on Fox News Channel between a senior writer for The Wall Street Journal, Gerald F. Seib and the host. Basically, Seib–an astute writer–was making the case that there was a very small window of opportunity for the United States to reach out for Kim Jong-un, and make some kind of a deal with the young North Korean dictator. In fact, Secretary of State Rex Tillerson has indicated that he is willing to meet with Kim Jong-un and his government’s representatives “without preconditions” and that he will persist in making diplomatic overtures “until the first bombs drop.” As you may know, I have long said that the Trump Administration, despite its bluster, will seek a deal with the North Koreans over their nuclear program. 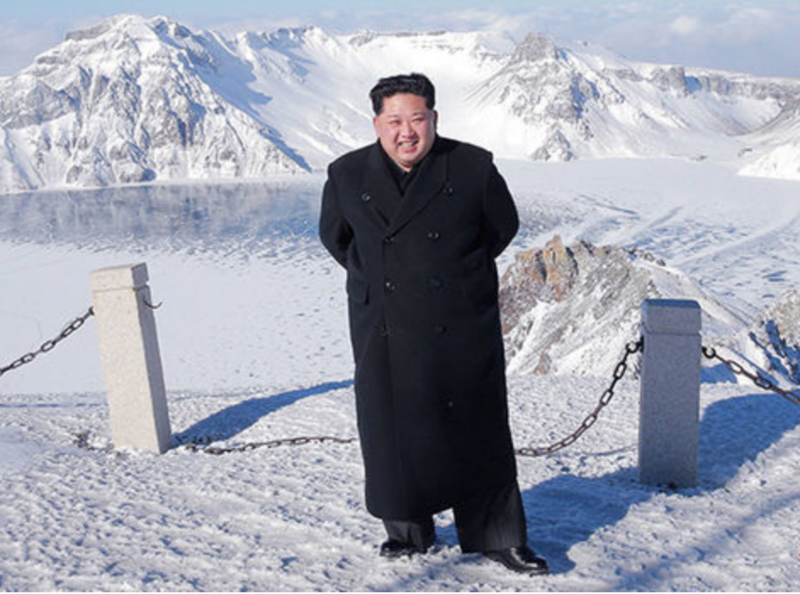 Many analysts in the West are inferring that Kim Jong-un is planning to make a major decision–or, as some are ominously saying, planning to enact a major atrocity–based on the fact that Kim Jong-un retreated to Mount Paektu, along the Chinese border this last weekend. Paektu has always had a symbolic meaning to the North Korean regime and when the young North Korean dictator was there previously in 2013, he enacted a major purge of several members of the North Korean inner circle–including his own uncle–who were loyal to China. However, this was the site also where Kim chose to visit shortly before ordering a highly successful wave of nuclear weapons tests. I believe that Kim’s visit to Mt. Paektu represents a strategic pivot on the part of the North Korean dictator. I truly believe that something momentous–and ominous–is in our future, especially as the North Koreans near completion of their nuclear weapons program (at least in regards to land-based intercontinental ballistic missiles). However, whereas most analysts end their assessment at that statement, I go one further and insist that such a deal will be short-lived and will result in the United States being caught unawares within the next 18 months. Fact is, Kim Jong-un is not playing with a full deck-of-cards–how could he be? Anyone who runs a state like North Korea is not capable of being completely rational, as one would expect a leader to be. The political rewards in the North Korean system are perverse; the Kim regime is notoriously corrupt and violent; and Kim Jong-un himself clearly has deep-seated issues that play themselves out on the international stage, like something out of Hamlet. The WSJ article examines the Center for Strategic and International Studies (CSIS) track of North Korean nuclear missile tests going back to 1984. What they have determined is that the window of opportunity for diplomacy is now, because from December until February is when North Korea traditionally slows down its nuclear tests. While Seib asserts that the “reasons for the slowdown are impossible to discern,” the CSIS folks (correctly) assert that the reasons for the slowdown have to do with North Korean military training schedules. By March and April, it is safe to assume that the tests will begin ramping up (though I also believe that President Trump’s trek through Asia in November played a part in Kim Jong-un limiting his aggressive actions). Seib and the CSIS analysts believe that these next three months will be crucial, if there is to be any diplomatic solution. Plus, as Seib indicates, with the 2018 Winter Olympics set to be hosted in South Korea, it remains to be seen how aggressive North Korea will behave. The last time the South Koreans hosted the Olympics in 1988, Kim Jong-un’s father, Kim Jong-il, had North Korea boycott the Olympics after a plan to co-host them with the South fell through. Kim Jong-il, who was in charge of North Korea’s powerful espionage unit at the time, ordered the bombing of Korean Air Flight 858 from Baghdad, Iraq to Seoul, South Korea in 1987, as a means of scaring international athletes away from the 1988 Summer Olympic Games in Seoul. If you’ll pardon the expression, the plan backfired on Kim Jong-il and further isolated North Korea, since the United States State Department ultimately listed North Korea as a state sponsor of terror (which, of course, it was and remains). In 2017, though, that designation was inexplicably lifted. While many believe that Kim Jong-un is a devout lover of sports–everything from Basketball (as evidenced by his bizarre friendship with Dennis Rodman) to desiring to turn North Korea into a leading “Sports Power”–what many misunderstand is that the Winter Olympics being hosted in Seoul presents a serious opportunity for mischief from the North. Just as Kim Jong-il used the 1988 Summer Olympics as an impetus for foul-play in the international arena, so too could the younger Kim use the 2018 games for his own sordid bemusement–especially with the games being at the start of next year’s military exercises in North Korea. Even if Kim Jong-un does stay his hand during the Olympics next year, his quest for a nuclear arsenal that can reliably threaten the United States will not diminish. As I have assessed previously, some kind of deal will likely be reached between the United States and North Korea. But, such a deal–as per the usual–will be fleeting. The North Korean regime has made its intentions consistently clear: it means to acquire the ability to believably threaten the United States with nuclear arms. This is a form of deterrence. Kim Jong-un does not want to end up like Saddam Hussein and Muammar Gaddafi; he knows that nuclear arms will be the only thing that dissuades the United States from seeking to topple his regime. More importantly, though, nuclear arms become a primary form of compellence when dealing with his non-nuclear South Korean neighbors (or even when seeking historical retribution against his Japanese neighbors). Many Western analysts disbelieve that the North wants to reunite with the South any longer. But, given the North’s unwillingness to countenance an actual peace treaty with the United States and South Korea–thereby officially ending the Korean War–and North Korea’s massive buildup conventional forces near the de-militarized zone (DMZ) separating the North from the South, something more than just petty brinkmanship is at play. KAL Flight 858 was bombed in 1987 by North Korean terrorists, acting under orders from Kim Jong-il as a means of frightening international athletes from attending the Summer Olympic Games in Seoul, South Korea in 1988. The twin dangers of an unstable psychology and an otherworldly, self-destructive ideology are at play when speaking of the North Korean regime. Kim Jong-un was elevated to power after the death of his deranged father, Kim Jong-il. When he rose to power, the younger Kim was beset with internal crises and challenges to his control. He acted as violently as he could to quell rumors that he was soft and to disabuse anyone of the idea that they could either topple him from within or that they could use him as a puppet. More recently, he murdered his own half-brother (who was protected by Chinese security services) out of fear that China was planning to topple his regime and replace it with the more even-handed leadership of his half-brother. Obviously, a more rational actor would recognize that assassinating someone in another country with biological warfare agents, as Kim Jong-un did, is far too risky–especially when Chinese security services are protecting the target. But, the internal logic of the North Korean regime is immune to what you and I would deem reasonable. Kim Jong-un acted as he did to preserve himself–even at the cost of alienating his Chinese benefactors, and causing a major international incident. Because of these notions that Kim Jong-un is not his father (or his grandfather, the founder of the current North Korean state for that matter), the younger Kim likely has an inferiority complex. The need to appeal to an absentee father and to live up to–and go beyond–the image of his “heroic” grandfather, Kim Il-sung, is likely at play. Toward that end, Western analysts should not ignore the possibility that the younger Kim is seeking to become more famous and “successful” than either his father or grandfather ever were by succeeding where they failed: uniting the Korean peninsula under Pyongyang’s control. This can only happen so long as the United States is kept over-the-horizon, and the costs for an American intervention to prevent a North Korean invasion of the South are drastically increased for American policymakers. Only a reliable nuclear weapons capability allows Kim Jong-un the possibility of keeping American forces back, while he takes what he wants to his south. From left to right: Kim Il-sung, Kim Jong-il, and Kim Jong-un. Three generations of tyranny. Western analysts should also keep in mind the overpowering presence of the Juche ideology in North Korea. This ideology combines the longings for the “good ole days” in which North Korea was a militarily strong nation (certainly stronger than the South) with the bizarre cult of personality surrounding the Kim family, and throws in racialist overtones of the Koreans being the “cleanest race” and wanting to isolate Korea away from the world in the “hermit kingdom,” to create a pernicious state religion. Juche has a tendency to reinforce the worst behavior of North Korean leaders, and drives those leaders to take shocking and provocative actions. One cannot underestimate the power and intoxication that Juche has on not only the North Korean leadership, but also the brainwashed North Korean people. So, this gets us into the all-mighty question of: will there or won’t there be a deal between the United States and North Korea? I maintain that some deal will be brokered, but such a deal will be temporary. Using the window of routine military drills in North Korea as an impetus to build a deal with North Korea is a silly idea. The North has made stunning progress in its nuclear weapons program. Their last real obstacle is the creation of a reliable intercontinental ballistic missile (ICBM) force that can physically threaten the United States. The North is almost there. It is only a matter of time, which I (and the DIA) assess to be no more than 18 months. Once the North has such capabilities, they will then need time to mass produce those capabilities and to distribute them throughout North Korea, so as to make their ICBMs harder to destroy. Further, the Seib article states that, “Nor has Pyongyang shown it can fire a ballistic missile from one of its submarines, which it would need to do to have a nuclear arsenal that could survive an American strike.” Yet, Popular Mechanics reported in October of this year that the North Koreans were developing their nuclear submarine force (they are currently building their second rudimentary nuclear submarine, designated as the “Sinpo-C” by the U.S. government). Now, the North Korean nuclear submarines are easily detectable. But, given enough time–just like with their ICBM and nuclear weapons program–their submarines will not be easily detected (especially with the Russians and Chinese lending critical technical support to the North Korean military). South Korean surveillance photos of where the North is building their second ballistic missile submarine (the Gorae, or “Whale” is the first such North Korean submarine which was completed in 2014). While the Popular Mechanics article, like the WSJ article, assert that the North Korean nuclear weapons capability will not be as grave of a threat, so long as the North relies almost exclusively on land-based ICBMs, what few acknowledge is the fact that North Korea’s land-based missiles are launched from mobile launchers. This is a capability shared with both the Russians and Chinese (as well as a handful of other powers). And, American war planners have never been entirely sanguine about our capability of destroying mobile nuclear missile launchers. Of course, many analysts would rebut what I’ve said by claiming that the North Koreans do not have anywhere near as many nuclear ICBMs as either Russia or China. However, I would posit that the North needs only time to mass produce enough ICBMs–and time is the one thing the decadent leaders of the West are inclined to give the North. This Chinese-built mobile missile launcher is used by North Korea to launch their ICBMs. For the North, the issue of nuclear weapons is an existential one. For the United States and the West, the question is one of passing interest. But, I would strongly contend that the question is existential for the United States, it’s just that we won’t realize this until the North either has the true ability to decimate an American city or actually does decimate an American city. By the way, as an aside, I’d like to add that, given the North’s ability to decimate the South Korean capital of Seoul within 45 minutes of an engagement with conventional artillery–and the fact that the North wants to take the South–it is quite likely that any nuclear attack from the North would not be directed against the South. Rather, a potential nuclear strike from the North would be directed against the United States herself, or American forces based in the region, such as those on Guam or Japan or possibly Hawaii (the location of Pacific Command). While the West will continue to bluster but ultimately deal with the North, they miss the larger picture: the intentions of the North Korean leadership. Those intentions are not benign; they are not simply posturing to make the deal of the century–far from it. The Kim regime’s entire existence is wedded to the idea that only that family can remake Korea whole and protect it from the outside world. Deals with the West buy North Korea time, and are wholly one-sided. Inevitably (and sooner than anyone thinks), the North will strike out with nuclear weapons, and we are entirely unprepared for that day.